The critical and more importantly the commercial success of Amish Tripathi’s debut book Immortals of Meluha opened the door for a new book genre in India. There are many authors trying to re-tell the mythological tales or ancient Indian scriptures from their perspective and many of them start modernizing them. Here are some of such books we’ve reviewed so far. 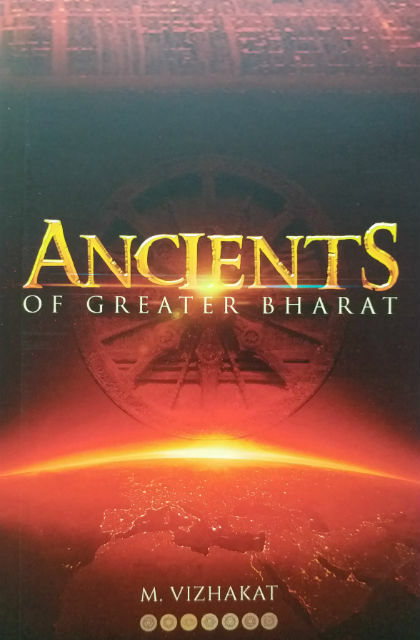 When I came to know about Ancients of Greater Bharat by debutante author Mohan Vizhakat, the intriguing title and the book blurb made me go for the same. And I am glad for that decision. So, let me share my unbiased views and reviews for Ancients of Greater Bharat with you all. A man is identified with his face, and the cover page is nothing less than the face of the book. Of course, we often say that don’t judge the book by the cover, but on the contrary, a large number of book purchase (or even borrow from a library, or even not to purchase) decisions are influenced by the book cover. The cover page of this book is interesting enough to make a good first impression. I personally feel that if some of the book characters are illustrated on the book cover, or it could have been made more interesting, the impression of the same could have been more. It is a little darker too. Let us take a bird’s eye view of the plot of the book. Please be warned that while I will try my level best to keep it “spoiler free”, some of them are unavoidable. Once upon a time in ancient Bharat (that is India 🙂 ) a sacred place was attacked by the forces under the order of Mahishasur. Hara, living a peaceful life, spending most of his time in meditation and waiting for his next Karmik call, came hurriedly to the place to rescue it. The damage was however done. The attackers took a very important thing which was not only precious but also considered as pious from there. The guarding and one of the most respected Bheeshma sage was brutally injured in this battle and was waiting for Hara only to convey him something important before taking last breathe. Hara decided to search for the attackers and hunt them down to punish them for the great sin they did. He then gives the attackers a chase by considering their possible route to return. Travelling through thick forests and dangerous surroundings, Hara, along with Nandi and others, able to find them after a few days. And rather than getting stunned by being identified and tracked by Hara and team, the leader of the attackers rather became happy! So, is there any much bigger conspiracy running? Was the attack only a plan to bring Hara out from his place? Hara, in the past, had played a very important role in destroying Tripura establishing himself as Mahadev. And for that, he is definitely admired by many but also considered as a foe by some as well. When Hara was on this quest to track down the attackers his own place was off guard. This situation leads to the actions and reactions which ultimately decide the Karmik path for Hara. On his karmik quest, he meets many people, daityas, vaitalas, a’surs, sages, legends and lords and this is how Ancients of Greater Bharat moves ahed. The book is definitely one of the fantastic books I got a chance to read. The author, Mohan Vizhakat is a decorated army veteran. It seems that he got a chance to read Indian ancient literature and hear the stories from the same since his early childhood. While the book mixes up timelines for many characters, it is a fiction and has to be read in that way only. The author’s command over the language is quite visible throughout the book. One thing you can clearly note while reading the book is the use of straightforward sentences and sentiments which reflects the author’s professional background with armed forces. Here are some of them. I’ll do whatever possible within my capacity to ensure that. Good. Let’s try to take as much rest as we can. Tomorrow will be a tough day. This book, being a mythological fiction, is expected to have some wise and philosophical lines and you can find them at many places in the book. Your emotions have always been your weakness as well as strength. There are some punchlines in the book which readers will enjoy, especially while reading in the context. Clearly, the newcomer is not a stranger to humour. I like the following lines, which talk about how usually religion is used to brainwash the people in a way that they chose being suffered willingly. Moyi had carefully nurtured the new religion on a path that glorified sacrifice and loyalty towards their cause. Don’t we see these techniques are implemented by many religious leaders, even these days? And the lines like the following clearly shows the outcome of such actions. Slowly many Daityan citizens who resisted conversion were forced to migrate out. The remaining ones converted willingly or coercively. Hara’s mind was like a volcano in the process of eruption. Our karmik paths tend to sometimes take a full circle. Those who seem like your enemy at one point may at other time prove to be your only resource of help. The book has its own downsides also. For example, the following definition in Glossary section should be updated to “Son of Anjani”. Anajaneya – Son of Anjali. But, there’s always more ways than one to skin a cat. Also, if you read the book carefully, you will find that it is written through different schedules. No, there is no continuity problem. You can find similar sentences/idioms/phrases appear twice in the gap of few pages, and then doesn’t reappear. Such things happen when subconsciously some statements are recognized in the brain and remain there for a specific period. The book explores many characters like Nandi, Bhadra Brihaspati, Sukhracharaya, Lankan king, Lord Hanuman and others. And, almost all of them grows gradually and turn out to be convincing. I like the exploration of Mahishasur and his allies and their characters and their course of action. Also, the sarcasm is found in many places. Which is how real soldiers give themselves a sigh of relief in tensed situations. Read the conversation between various characters when Hara and others are taken to the Hiranyapura by Bhairava, for example. The floating city of Hiranyapura and Lanka, and even the “God’s own country” (you know what I mean, right?) are nicely explored. The way in which various aspects of Kundalini, Yoga, Meditation, and Jwalaprabha are explored in the book will surely amaze you. Don’t miss the chapters where the author explains “Gangavataran” in his own words and justifies the possible reasons why Shiva Lingam is bathed in water and milk. Don’t think that whether it is true or false, but, look at the way the author has explored it, it will surely amaze you. The way a connection between the weapon (be it Saptishul or Sharang) and its user is elaborated requires a must mention. If you love to explore mythology retold in different aspect with a unique vision, you cannot afford to miss this book. I see a worthy competitor for Amish Tripathi in Col. Mohan Vizhakat. 8.5 stars out of 10.